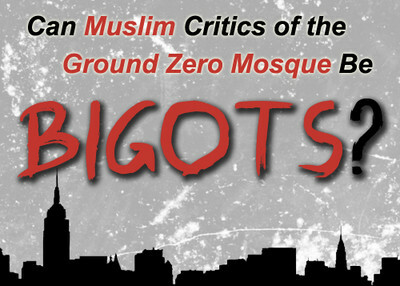 Defenders of the proposed Ground Zero mosque are quick to write off opponents as bigots simply out to stir up hatred of Muslims. "[The] Cordoba House is wrong because America's Muslims do not yet exemplify the time-honored commandments, philosophies and tenets of the great men and women who founded our country -- and even more sadly, of the great religion they claim to follow. A mosque is not a monument. It is a place where worshipers gather to strengthen their beliefs en masse -- a place where they resolve to practice those beliefs with consistency and vigor. An American Muslim, one who believes in his or her American identity first, could not possibly hope to do that near the place where fellow citizens were murdered by Islamic mobsters seeking vanity and infamy for their crimes." "Religious freedom is central to our nation - and that is why the location of this project is so misguided. Ground Zero is purely about being American. It can never be about being Muslim." Editor's note: This article has been edited since its original posting to correct an error. "IPT will moderate reader comments. We reserve the right to edit or remove any comment we determine to be inappropriate. This includes, but is not limited to, comments that include swearing, name calling, or offensive language involving race, religion or ethnicity. All comments must include an email address for verification." However, a majority of the comments here (and the entire site) is dedicated to demeaning Islam, the fastest growing religion in the world, though some pseudo-intellectuals would have the public believe that Islam is not a religion (while it is a religion). I doubt that this site will be "moderated" by the owner (an infamously known Islamaphobe) and that this comment will be posted. The opposition of Park 51 by some Muslims is not an example of bigotry, but an example of lack of lock-step in the Muslim community. Muslims aren't automatons. There are many differences within the Muslim community. Put me on record, as another Muslims, who supports Park 51. I'm looking forward to this project's completion so I can plan a weekend in prayer and recreation at this facility! You stated - "They can't be trusted." It those are you people you're suggesting that we not trust, I'm WAAY ahead of you on that suggestion!! But thanks for the recommendation anyway....! TAQUIYYA and what it means to us! taquiyya=lying allowed, permitted and promoted to advance islam. Why do they insist on building so close to ground zero? After each ghazva, the Prophet ordered the creation of a rabat --or a point of contact at the heart of the infidel territory raided. The rabat consisted of an area for prayer, a section for the raiders to eat and rest and facilities to train and prepare for future razzias. Later Muslim rulers used the tactic of ghazva to conquer territory in the Persian and Byzantine empires. After each raid, they built a rabat to prepare for the next razzia.